The Map Room - Defense Department Testing to Affect GPS Signals in Southeastern U.S.
Defense Department Testing to Affect GPS Signals in Southeastern U.S.
Engadget passes on a Federal Aviation Administration advisory (PDF) that, due to Defense Department testing, GPS signals may be “unreliable or unavailable” within several hundred miles of a point off the coast of Florida and Georgia for brief periods between January 20 and February 22, 2011. The advisory is aimed at pilots, but we can surmise that terrestrial GPS usage — admittedly less a matter of life or death than aviation — might be affected as well. 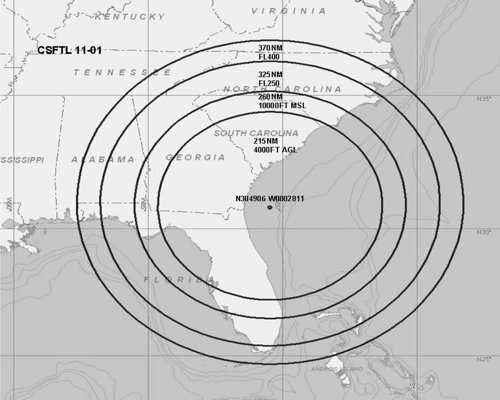 The radius affected increases with altitude: 370 nautical miles (685 km) at 40,000 feet (FL400, 12,200 m), falling to 215 nautical miles (398 km) at 4,000 feet (1,220 m).